My inner voice completely rejected her answer. I WOULD SLEEP AGAIN! I knew I would. Good thing I listened to that inner voice. Granted, it was years coming. I now have three children, ages 8, 5, and 2. After 9 years of being pregnant or nursing, my body finally belongs to ME again! As do my nights. Oh sure, there’s still the occasional sick child or nightmare, but it is nothing at all like the interrupted sleep of the past 9 years. On January 1st, I had one real goal in mind. I wanted to sleep better. I wanted to rest and rest and rest until I felt … human. After a month of sound sleep night after night, I am finally glad to report that good sleep works. If you haven’t already, you should go snag a copy of Power Sleep : The Revolutionary Program That Prepares Your Mind for Peak Performance and read it. The book will change your life. It’s written by Dr. James Maas, and it’s the most well-written book on this subject I’ve ever come across. Not only is it informative, it’s entertaining. While I’ve always understood that sleep makes a HUGE difference in how I feel, I didn’t realize it could have so many far-reaching health benefits either. This book does an excellent job of laying out the effects of not getting enough good rest. A good night’s rest is about 9.5 hours during Autumn and Winter, and about 8.5 hours during Spring and Summer. How do you measure up? Are you sleep deprived? Dr. Maas has an entire chapter dedicated to what he calls “family sleep traps.” While I don’t necessarily agree with *all* of his tips found in the section on “Tips for Exhausted Parents of Newborns, Infants, and Children,” I did find myself thoroughly pleased that he at least tried to address the issue naturally. This is, perhaps, one of the best things about this book. 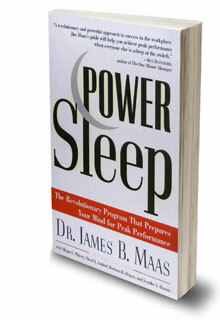 Unlike other books written by doctors on improving sleep, Dr. Bass does NOT recommend sleep medications! Instead, he gives you the tools you need to get quality sleep … naturally. 1. I gave myself a bedtime. This is, perhaps, the hardest thing to do! I’m a very task-oriented person. That means I like to do things until they’re done, regardless of what a clock says. By giving myself a bedtime, I now have to (gasp!) think ahead and ask myself if I can finish my task before bed. If I can’t, then I just don’t do it. I wait to start it until the next day. At first, I also wasn’t even almost tired at my bedtime! That’s because my hormones were all out of whack. Dr. Ross addresses this in her book, The Diet Cure, and Dr. Maas touches on it in his book, too. Essentially, my cortisol levels were too elevated too late in the day. Ideally, your cortisol levels are highest in the morning. This is what allows you to wake up feeling fresh and energetic, ready to face your day. If you wake up with low cortisol levels, then you wake up with reluctance and feel groggy. By delaying that cortisol “high” to later in the day, my body also pushed back the manufacturing of melatonin — the hormone that tells your body you’re sleepy — until much later at night than normal. That’s because melatonin production ramps up as cortisol levels wane. So, I’d stay up later, with more energy. Unfortunately, this is a terrible spiral that’s virtually impossible to control by willpower alone. If I were to go to bed earlier, I’d just lay there and suffer from insomnia. That’s because my body wasn’t making enough melatonin on time. If I were to force myself to wake up earlier, I’d feel even groggier than usual because my cortisol levels would be even lower. What was I supposed to do? Lay in bed for hours while waiting for sleep to come? No. I needed to help push my hormone levels back into balance, but to do that, I needed better sleep! See what I mean about a spiral? It’s like being between a rock and hard place. That’s why I also implemented the other tips below. 2. I strategically took melatonin. I’m not a big fan of taking supplements for extended lengths of time. But, I found that the extra melatonin went a long way towards helping me “re-train” my body to feel sleepy at the right times. After about a month of using it, I no longer needed it, so long as I faithfully followed the other tips below. This is the melatonin I used. It’s only other ingredients were rice flour as the transfer medium and gelatin for the capsule. Plus, it’s at a nice, low 1mg dose so that I could mete out exactly what measure I needed. And it’s under $4 a bottle! I started by taking 1mg immediately after my kids went to bed, around 8pm each night. If by 9pm I wasn’t feeling sleepy, I’d take another milligram. My goal was to start my bedtime routine by 10pm and be asleep by 11pm. 3. I took amino acid supplements. Again, this was only temporary. But when I took Dr. Ross’s amino-acid deficiency survey, I tested as needing L-Tryptophan and GABA. Her instructions had me taking GABA in the mornings, and L-Tryptophan in the afternoons and evenings, just long enough to correct the deficiency (about a month). Now I no longer need them, and don’t anticipate needing them again until life sends me additional stressors. I intend to write more on Dr. Ross’s research, but if all this is news to you, may I suggest you read my post on How To Beat Sugar Cravings with Glutamine? It offers a little introduction to Dr. Ross’s theories about neurotransmitter deficiencies. 4. I ate a late-night, high-protein snack. I used to feel snackish some time after dinner, but before bed. Most of my cravings were for carbohydrate heavy foods that would keep me awake for a few more hours. Your body breaks down protein to make the neurotrasmitters that regulate your hormones, sleep patterns, etc. By eating a high-protein snack, I was giving my body the fuel it needed to help fix the neurotransmitter deficiency and right the hormonal imbalance while still satisfying my munchies. Now I no longer get snack cravings at night. If I do, I know it’s a sign I’ve stayed up too late! 5. I dimmed all the lights after sunset, particularly my monitor. Watching TV or a computer screen after dark can wreak havoc on your night time rest. That’s because both are high in bright blue light that mimics sunlight. That bright daylight-type light sends the wrong signals to our brain, telling us it’s time to stay alert and wakeful. To dim the lights, I did a few things. First, I installed f.lux on my computer. This free computer software changes the settings of your monitor according to the time of day and the types of interior lighting you have in your house. At night, it will match your monitor’s light to type of ambient light in your room! Click here to download f.lux for free. Second, I bought a pair of Gunnar computer glasses. These glasses are specially designed to reduce the eye-fatigue associated with working on a computer. 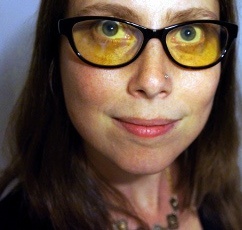 Plus, they have amber-tinted lenses that help reduce the blue glare of the computer monitor or TV screen even further. Here I am sportin’ a pair of Gunnar’s. They come in a variety of frames. These are the Joule frames, but there are plenty of others. Click here to see the huge variety of available Gunnar glasses and read product reviews. Finally, I ditched the overhead lights in favor of lamps. As soon as the kids were in bed, I’d walk around and turn off all the overhead lights. I’d do all my night-time living by the light of shaded lamps. 6. I slept in the dark, and used earplugs. First, I tried to remove all sources of light from my bedroom. I turned my clock away from me, closed my blinds so the street lights weren’t as bright, closed my doors so that hall lights or light coming in from other windows wouldn’t be as bad, etc. Yet despite those measures, there was still a LOT of ambient light in the room. I love my bedroom’s drapes, and didn’t want to invest in light-blocking ones. So, I did what I thought I’d never do. I became the lady who sleeps with a night mask. It seriously helps! This is the most comfortable one I found. I also started sleeping with earplugs. This also made a surprisingly HUGE difference in the quality of my sleep. It blocks out street noise, the air-conditioning cycling on off, the over head fan, the buzz of the nearby clock — all the noises that I didn’t think affected me at all. But when they’re gone, sleep came much more quickly! If you’re going to buy earplugs, invest in some like these. They’re ultra soft. You just roll them up to compress them, insert them into the ear canal, and let them expand to fill your ear canal and block out noise. I tried a different brand at first, and although they were great at noise blocking, I awoke in the morning with a sore ear canal. If that happens to you, know that you don’t have to live with it! There are plenty of companies that specialize in softer, more comfortable ear plugs. I find that one pair lasts at least a couple of weeks, possibly more before its quality starts to deteriorate. And don’t worry about still being able to hear your kiddos! Trust me, you can still hold a conversation while wearing these, still hear if your children or spouse needs you. They just make the world … quiet. 7. I enacted a bedtime routine. I used to just fall into bed whenever the idea seemed right. Now I have a whole relaxing routine that ends with me lying in bed and reading a book for a half hour. Having a routine trains your body to expect to get sleep after you do it. It’s a bit like Pavlov’s dogs. The more you do the routine and sleep after wards, the easier it is to sleep after your routine. 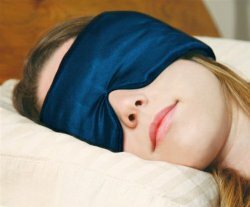 What are your tips for getting a good night’s sleep? Tagged GABA, glutamine, melatonin, memory, sleep. Bookmark the permalink.